Tyco BMW’s Ian Hutchinson this afternoon added the RL360 Superstock win to the Supersport trophy he claimed earlier in an uncontested race, smashing the lap record from a standing start, after rival Michael Dunlop retired at the pits on lap one with a broken gearlever. 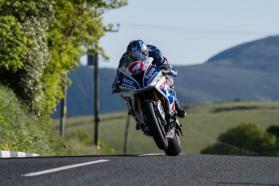 Hutchinson had set off from the Glencrutchery Road like a scalded cat with its nuts in a vice, opening a five-second lead over Dunlop’s Hawk BMW by Ramsey to cross the line with a 133.098mph and 17m00s lap. The Bingley man was then in a race on his own as third-placed man James Hiller was already more than 20s behind while Dunlop, who had set a 131.045mph lap, pulled in. Hutchinson was faster again at Glen Helen on lap two but then knocked his pace off a little as his board will have told him about Dunlop’s woes, and he finished lap two with just a 132.9mph lap! As Hutchinson opened his gap on Hillier to just more than 40s, Dean Harrison went past the Bournemouth man’s Kawasaki for second place, leading by 0.295s at Ballaugh Bride on the final circulation with John McGuinness in fourth place and Gary Johnson 6.841s further back. At Ramsey, Harrison had doubled his lead over Hillier to half a second while Michael Rutter began to catch Johnson for fifth. At the Bungalow, Harrison upped his pace to open his gap to Hillier by a second as Johnson went past McGuinness but Rutter had passed them both and snatched fourth place. Harrison bagged second with a two second gap to Hillier with a 131.139mph last lap while Rutter stayed fourth and Johnson fifth.